Caption slip reads: "Photographer: Forbes: Date: 08-25. Reporter: Towers. Assignment: Suicide at Dept. of Water and Power. 70: George A. Uman, Chemist for Dept. of Water & Power. 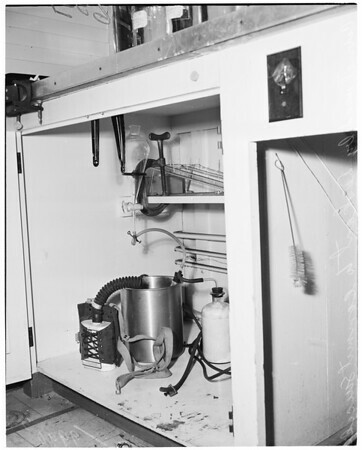 69: Cabinet & apparatus used by suicide [victim]. Eugene M. Diskant."